Sometimes ago many users of WhatsApp Messenger complained about the service that they were sending messages or were receiving were not encrypted, it was really easy for anyone on the same network with the the right Android app could eavesdrop on them. The WhatsApp Messenger app was disappeared from Marketplace for some time after, and now on its return WhatsApp support team has confirmed that, in the new version of the WhatsApp, the messages are now encrypted. Well, after a while Whatsapp has fixed that and now offers message encryption in its new version for iOS devices. The current version is 2.8.3 and available for download from the App Store. Apart from that great improvement in security, it also brings the automatic download of images. The Automatic Picture Download is not allowed to be configured, for example, we can set it to only download the images to wifi networks , so if you’re with a limited data plan is automatic discharge would affect us. WhatsApp 2.8.3 version also introduced a new feature called ‘Forwarding Picker.’ This now allows you to show Groups, Recents and Contacts, making it easier to choose who you want to forward your message(s) to. Updated Korean, Chinese and many other translations. 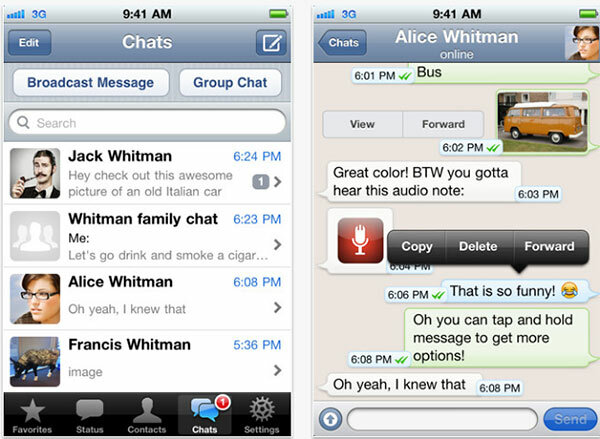 WhatsApp Messenger is one of the top downloaded apps in the App Store since its release. WhatsApp Messenger is basically used for group chats with friends and family on various platforms like iOS, BlackBerry, Android, Windows Phone, Symbian. In addition, this update is very important and 100% recommended as there are many applications from mobile to Android that can track what you’re sending. These updates are available only for iOS devices, so Android users will have to wait a bit. If you haven’t downloaded the app, then navigate to the iTunes store as WhatsApp Messenger is available for download for $0.99.